It's that time of year. It's cold outside and your plan to work out three or four times a week has fallen by the wayside. After all, reasons not to exercise can be easier to come by than arguments to actually drag yourself to the gym on a dark, frigid morning. 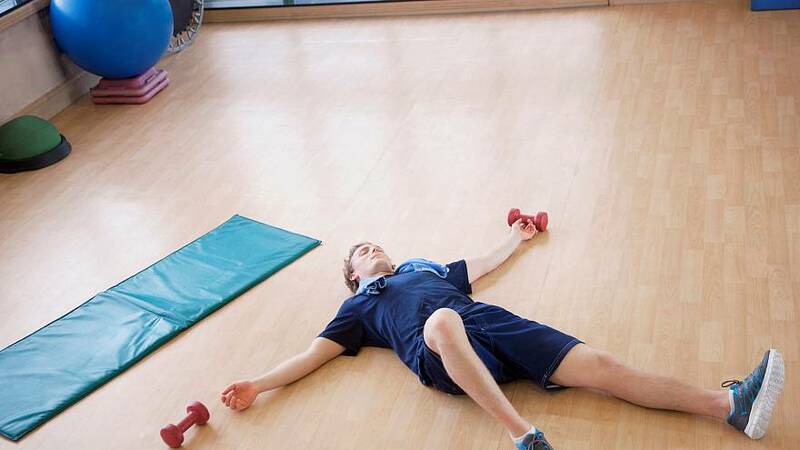 Yet, while those excuses might sound perfectly legitimate when you formulate them in your head…are they really good reasons to abandon your fitness program? Probably not. We asked some of our favorite trainers for the most absurd, hilarious and just plain crazy excuses they've ever heard — or used themselves. Next time you find yourself scraping for an excuse to skip leg day, remind yourself that you don't want to end up on this list next year. Yes, there are moments in life when you should probably not prioritize your workout over a last-minute emergency. These are not those times. 1. Home "Disasters." If a pipe bursts in your home, the toilet overflows, or a natural disaster befalls your neighborhood, we'd understand if you couldn't make it to the gym. But Daily Burn Pilates instructor Andrea Speir says, "I had a client call me and tell me she saw an ant in her house and couldn't leave to come to her session because she had to wait to see if more ants showed up," Speir recalls. "She said, 'When there's one, there's usually a bunch lurking somewhere…' So she wouldn't be able to make it in." 2. Your Own Mortality. Sports performance coach and professional athlete Andia Winslow says she'd been prodding a friend/client to return to workouts for awhile, when she received the response: "I recently died." If this were true, we'd say it would be a pretty good reason not to show up to a workout. But, unless this DM was from the undead, it seems unlikely. "I definitely got my own abdominal workout from laughing at the entire text thread," Winslow says. 3. Your (Not-So) Supportive S.O. Sure, if you break up with your significant other we won't blame you for skipping a workout or two indulge in some ice cream. But Noam Tamir, CSCS, founder of TS Fitness in New York City, says one client had to cancel for other reasons, "[She said], 'My boyfriend is in town and he gets jealous because he thinks I have a crush on you so I can't come in." Lame? Yeah. 4. You're Too Busy Today. Good luck convincing a trainer that something else on your schedule should preclude your session. Larysa DiDio, a personal trainer and fitness author who's trained celebrities, Olympians and professional athletes says, "A high profile client of mine tried to cancel because she had to shop for her husband's birthday. I wouldn't allow it and made her sprint with me to the store, down Madison Avenue. She did squats and lunges in the store while we shopped and then sprinted back home." So much for that excuse. 5. You Got A Boo-Boo. Even instructors dream up reasons to skip the gym. Roger Lawson, C.S.C.S., of RogLawFitness (who deems himself the Sultan of Sexification, by the way), cops to having thought up a few creative excuses of his own over the years. One of his favorites: "I cut my finger and I don't want it to get infected." Band-Aid, perhaps? 6. Too. Much.Whiskey. Ever woke up after a night of partying, trying to piece together what happened? Rob Sulaver, CEO and founder of Bandana Training, once got a message from a client reading, "Yo Rob. Sorry I can't make our workout today, I accidentally woke up in Berlin." Sulaver says he never quite got the whole story, "But my client was doing a little bit of partying and eventually came-to in Berlin…" For the record…Rob is based in New York City. 7. The Medical "Emergency." This may seem like the perfect get-out-of-jail free card. After all, nobody can fault you for a trip to the ER, right? That is, unless you accidentally blow your own cover. Winslow recalls, "A former client canceled about two hours prior to a session citing 'severe IBS' and an emergency rush to see her physician. I checked Instagram. She was at Bloomingdales on a shopping spree buying some 'hot Louboutins!'" While compiling these excuses, one thing became clear: Your trainers aren't loving your last-ditch attempts to preserve your blowout. 8. You Fear the Fashion Police. Yes, it's true that fitness is experiencing a fashion moment. But trainer Tony Gentilcore, strength coach and co-founder of Cressey Sports Performance, says "I once had a woman state to me that the color of the clothes she was wearing that day didn't match her mood, so as a result she couldn't work out." 9. Must Moisturize. Lawson, the aforementioned sultan, admits he's relied on a grooming excuse or two in his day, including that, "I don't have any lotion and I'm far too ashy to go out in public." 10. You're Too Relaxed. "I think my favorite quote of all time from a client was, 'I am so sorry I can't work out. I had a massage yesterday and I don't want to mess that up," says Michelle Lovitt, strength and conditioning specialist and fitness expert. 11. That Blowout Was Expensive. By far, the most common category of excuses we saw from trainers were related to your 'do. Brett Hoebel, celebrity trainer on NBC's The Biggest Loser Season 11 and author of The 20 Minute Body, says he'll always remember a client who came in with full hair and makeup and stopped training in the middle of a session. When asked what was the matter she said, "You're going to make me sweat and ruin my hair!" He learned his lesson. "Now, when a woman comes in with a blowout I ask her if she's prepared to pull her hair back and get into it," Hoebel says. Garson Grant, master trainer at The Sports Center at Chelsea Piers in NYC, says he's fallen victim to this excuse, too. "The funniest one I've heard was, 'I don't want to sweat, I just did my hair,'" Grant says. 12. Mani-Pedi Problems. Fitting in workouts is all about planning ahead of time, people. And that means not scheduling a nail appointment adjacent to your sweat session. "A woman told me she just got a mani-pedi an hour before our training session and the polish was still wet," says Jason D'Amelio, MS, ATC-L, ART-C, certified athletic trainer and owner of Total Athletic PT. Maybe get your polish done after your workout next time, eh? 13. Faux Lash Flaws. News flash: high-intensity interval trainingwill involve some sweat. But Dyan Tsiumis a trainer at The Fhitting Room in New York City, a gym specializing in HIIT, says a client once told her, "I can't sweat. The heat makes my fake eyelashes fall off." 14. Dog Poop. OK, this one might be legit. D'Amelio says a woman called out once after walking her dog. "She stepped in poo, so she couldn't train [because] she had [crap] on her shoes…which I was actually thankful for." Trying to get back in shape after you've spent the past few months as a couch potato can be tough — and downright intimidating. Plus, workouts can be painful. Does that mean you should take the easy way out? Not according to these trainers. 15. It's Too Hard. Fear you'll collapse mid-burpee and embarrass yourself? "Something I hear often from friends and people I socialize with is that they 'need to get in shape' before they come to one of my classes," says Liz Barnet, a personal trainer and instructor at SLT and Uplift Studios in New York City. Daily Burn trainer Ben Booker, who devised the killer new LTF strength-training program at Daily Burn, says he's heard similar excuses when convincing people to try LTF. "Just jump in and modify!" Booker advises. "[Getting in shape] doesn't happen overnight, but it happens. 16. I Can't Be Seen at the Gym Yet. If you feel like you can't even mingle with the super-svelte crowd at the gym until you lose a few, you're not alone. Emily Cook Harris, an instructor at the Fhitting Room, says clients tell her, "People will see me before I'm ready!'" We feel ya. But we guarantee that those selfie-taking gym snobs you fear are only looking at one thing while they sweat — themselves. 17. The Fear of DOMS. Avoiding DOMS, or delayed onset muscle soreness, is another common cop out. Cook Harris says she's had clients say, "I didn't workout the past two days because I didn't want to be sore for our training session." Hmmm. And she's also heard, "I'm going to an awesome party and don't want to be sore because I plan to do a lot of dancing. So we should cancel our session." Two points for honesty? 18. But I'm On a Diet.Dolvett Quince, the celebrity trainer on season 16 of NBC's The Biggest Loser, and author of the New York Times best-selling The 3-1-2-1 Diet, says the worst excuse he's ever heard is, "As long as I don't eat a lot, I'm fine." While we know you can't out-train a bad diet, exercise can be key to firing up your metabolism — and getting toned. 19. I'm Too Hungry Post-Workout. We've all been guilty of slamming a burger due to runger. But that doesn't mean you should just laze around when you're on a diet. Kira Stokes, an instructor at BFX Studio in New York City, and the founder of Kira Stokes Fitness says she had a client tell her, "'I am more hungry when I exercise, so I'm going to take a few days off so I eat less." Stokes' reaction: "WHAT?!?! Clearly a long lecture ensued and no session was allowed to be canceled. End of story." 20. I'll Start Next Week. Remember when we said scheduling your workouts is key to actually making them happen? Well, don't let just one slip throw off the whole week. Lawson admits he's gone down the road of, "It's Tuesday and I was supposed to start working out on Monday and I don't want to throw off my schedule, so I'll start next week." 21. The Fake Out. In a truly devious move, Winslow says she's had a client try to convince her that they actually did show up for a missed workout. Winslow recalls, "[He said] 'I showed up to the workout but where were you?' As though I mixed up the location and stood him up." Winslow was only training at one facility at the time. Nice try, buddy. Some excuses are so impressive you just kind of have to appreciate them. If you ever land in one of these situations, we officially give you permission to skip your workout, too. 22. You're a Gambling Man. D'Amelio says a client canceled on him because he had to run to place his bets at the Belmont Stakes before they closed. On the bright side: That client won $5,000. 23. Car Problems. Professional athletes are rife with excuses, according to Tim Hartwig, C.S.C.S., who has worked with more than 300 pros as a strength and conditioning specialist. He says, "All my athletes [had] showed up to training for the day, minus one…Mind you, this was for the 2010 NFL Combine coming up in a matter of weeks, and millions of dollars were on the line for the draft." When his athlete showed up the next day, Hartwig said he asked him what happened. "To my astonishment he said he was on his way to the facility when he noticed…it was time for him to change his oil in his car so instead of training he decided that was more important." That client did get drafted. And he later went on to win Superbowl XLVI. 24. You Just Won an Oscar.Daily Burn Black Fire trainer Bob Harper, who recently starred on season 16 of The Biggest Loser, got the mother of all good excuses from one high-profile client. Harper says, "I can't give you any names but I once had a client cancel on me saying, 'I can't work out today because I won an Academy Award last night.'" Fair enough. 25. Real Talk. "I'd much rather sit around naked and eat ice cream and watch Game of Thrones," says Lawson. Let's face it: We've all been there. This story originally appeared on Life by Daily Burn.